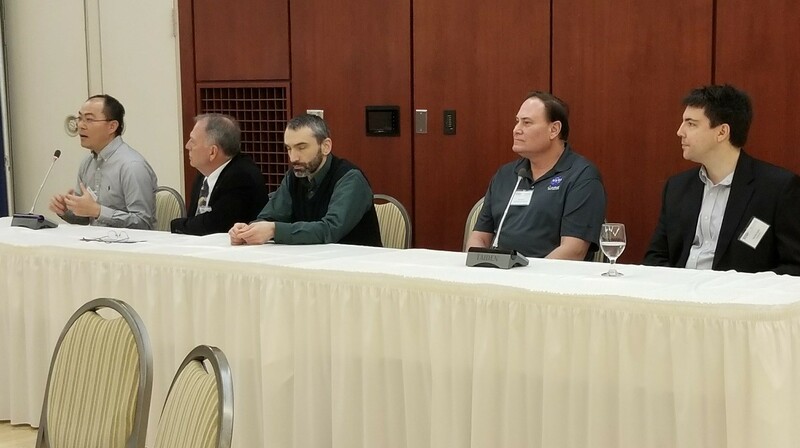 On February 20th and 21st representatives from Goddard’s Strategic Partnerships Office (SPO) attended the Institute of Water Security and Science (IWSS) Spring Conference in Morgantown, WV at West Virginia University. The conference was attended by approximately 150 attendees and focused on water security and research sciences. Representatives made contacts with the Maryland Chesapeake Bay Foundation as well as university researchers who showed interest in NASA’s capabilities and resources. NASA Goddard exhibited along with the Federal Labs Consortium (FLC), and showcased 5 technologies from Goddard’s technology portfolio that offer potential water and water science commercial applications. Goddard’s SPO arranged for Dr. John Bolten, a subject matter expert in water research and sciences from Goddard’s Sciences and Exploration Directorate’s hydrology division, to present on his research using space-based observations for improved global water security and sustainability. Dr. Bolten also participated in an open panel discussion with the attendees. SPO Senior Technology Manager Ted Mecum, was asked to participate in the end of day open discussion panel as a representative of Federal Labs and as a subject matter expert in government partnerships and technology transfer. Ted spoke on the utilization of government resources through Federal labs, and how to work with NASA.